Woven from the hair of the most elusive and reclusive folk heroes, this cloak was previously worn by the universe’s champion hide-and-go-seek player. 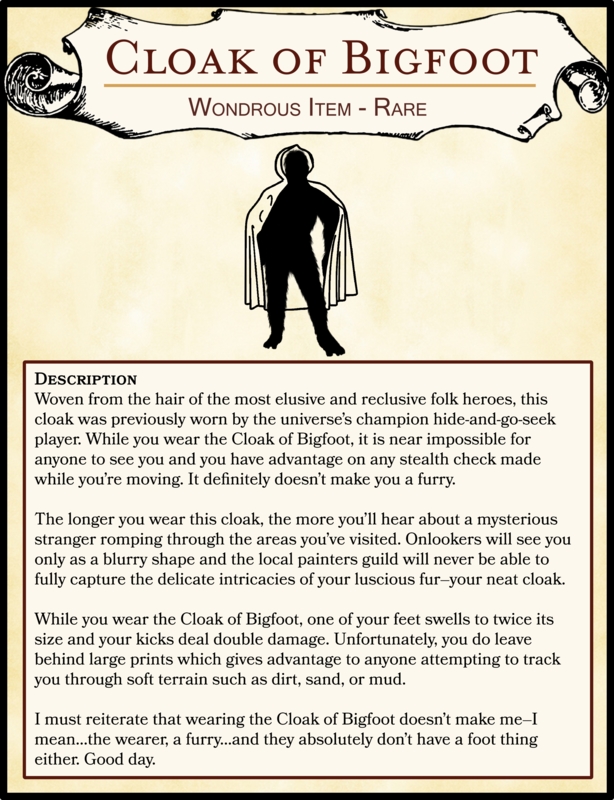 While you wear the Cloak of Bigfoot, it is near impossible for anyone to see you and you have advantage on any stealth check made while you’re moving. It definitely doesn’t make you a furry. The longer you wear this cloak, the more you’ll hear about a mysterious stranger romping through the areas you’ve visited. Onlookers will see you only as a blurry shape and the local painters guild will never be able to fully capture the delicate intricacies of your luscious fur–your neat cloak. While you wear the Cloak of Bigfoot, one of your feet swells to twice its size and your kicks deal double damage. Unfortunately, you do leave behind large prints which gives advantage to anyone attempting to track you through soft terrain such as dirt, sand, or mud. I must reiterate that wearing the Cloak of Bigfoot doesn’t make me–I mean…the wearer, a furry…and they absolutely don’t have a foot thing either. Good day.